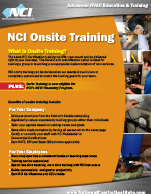 Below is quick access to downloadable PDFs about NCI training, events and products. 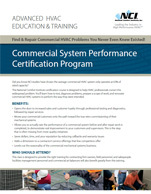 Want to set your HVAC service company apart from your competition? Are you ready to move beyond the SEER and AFUE trap? 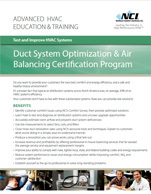 Set yourself apart from competitors by knowing how to optimize a duct system so it delivers the heating and cooling the equipment was designed to provide. 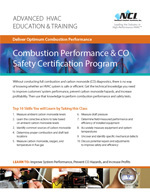 Deliver optimum combustion performance and keep your customers safe. 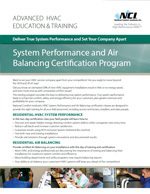 This course helps equip HVAC professionals with the knowledge and tools they need to balance commercial HVAC systems up to 20 tons, including Kitchen Exhaust and Make-Up Air systems. Find and repair commercial HVAC problems you never knew even existed! 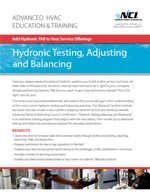 Looking to balance hydronic systems you install and/or service? This class will help you with practical, hands-on, step-by-step training to do it right. 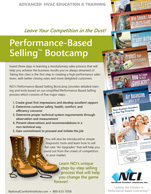 This course is the first step in creating a high performance sales team, with better closing rates and more delighted customers! 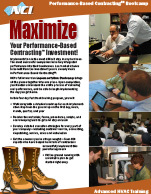 Maximize Your Performance-Based Contracting Investment! 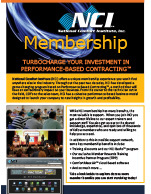 NCI Membership will help launch your company to new heights in growth and profitability through a cohesive performance-based business model, special discounts and a wealth of information. 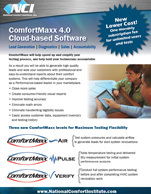 ComfortMaxx will help speed up and simplify your testing process, and helps hold your technicians accountable. 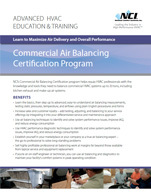 The same NCI Certification training that we offer year-round can be delivered right to your doorstep.